How can I go from totally down in the dumps - see the story about losing my brain and my image files - to a state of "oooh that's so cool" excitement? The two word answer is: NEAT LIVING where my fellow LinkedIn Blogger Ariane Benefit holds forth en blog. If only Ariane lived next door. 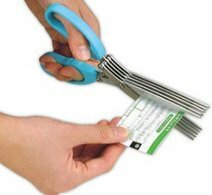 I want to try these five blade shredding scissors right now. To heck with the actual shredding function. And you haven't seen anything yet. Ariane claims to be a "Professional Organizer and Neat Living Coach" but you can't fool me. She is actually a general goodie finder and guru of both handy stuff and simplification. This blog is way too much fun to be about actual organizing. Check out her blog for other insights, finds and ideas. Amazing! Can Virtual Reality Provide the Future of Education? Can Barack Obama Fix Twitter? But What Do I Do When I GET to Second Life? Everyone Needs One: What's Your Lure? Clara on Everyone Needs One: What's Your Lure? or just drop in & pick up a frozen pea t-shirt, pea beach-ball etc. *Drop a notecard to my SL avatar Tynan Clary anytime. © 1985 - 2008 Copyright Susan McMackin Reynolds, All rights reserved.